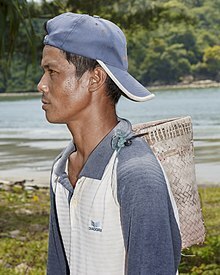 A Rungus fisherman in Kampung Loro Kecil, Kudat, Sabah, Malaysia. The Momogun Rungus are an ethnic group of Borneo, residing primarily in northern Sabah in the area surrounding Kudat. A sub-group of the Kadazan-Dusun, they have a distinctive language, dress, architecture, customs, and oral literature. As with most indigenous ethnic groups in Borneo, culture revolves around rice; however, coconut and banana groves provide cash income. Women weave cloth on backstrap looms, and make containers from vine or beadwork. Many Rungus now work in town, and have abandoned the communal life of the longhouse for modern Malaysian society. Traditionally animist, with female shamans, most Rungus are now Christian. A large ceremonial bumbu ikan (fish trap) in a Rungus village in Kudat, Sabah in Borneo. A longhouse can be seen in the background, with distinct outward-sloped walls. Considered one of the most traditional ethnic groups in Sabah, many Momogun Rungus live in longhouses, with each family having its own separate quarters off a common hall. At the edge of the communal hall, a well-ventilated platform of split bamboo with outward sloping walls provides a place for socialising and communal work. The Rungus longhouse is quite different from the Murut longhouse. The houses are not perched on high stilts, but are usually only three to five feet above ground. The roof is low, and the walls are outward sloped. In olden times, longhouses of over 75 doors are said to have been common. Now, they rarely exceed 10 doors. 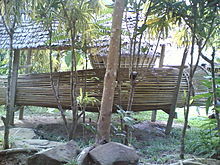 Usually single story, more modern two-story versions of the longhouse also exist. Single-family houses are sometimes built near the longhouse – these take the same form, but are curiously short, looking like a slice from a cake. The traditional Rungus dress is black in colour, often with hundreds or even thousands of dollars worth of antique beads. Traditionally all of the Rungus women wore heavy brass coils around their arms, legs and necks. Brass arm coils are often accompanied by white and coral shell bracelets. Rings of brass may also be worn around the waist. This beadwork and its designs easily distinguish the Rungus from the other ethnic groups of Sabah. "The beadwork often tells a story and this one in particular tells of a man going spear-hunting for a riverine creature". The pinakol consists of a pair of flat beaded bandoleer-type belts worn crossed over the chest and back. The sandang is a pair of long beaded strands, mostly with matching beads. These are worn crossed over the chest like the pinakol. The sullau is a flat beaded choker worn around the neck with two clamshell discs, one in front and one in back. Small bells are attached in the front. They make the discs out of plastic nowaday The tinggot is a short choker, either single beaded or with narrow beadwork. Men and women wear these. The togkul is a necklace some 26 inches (66 cm) long with beads similar to the sandang but smaller and worn around the neck. The sisingal is a narrow beaded band worn around the head. The rampai is made of cotton, flowers and beads worked into the hair. The orot. "Little brass rings and antique beads looped through thin strands of stripped bark (togung) becomes a wide and colorful hipband. To wear this the orot is slowly and carefully coiled around the hip. Then a last string of beads (Llobokon) is hung loosely from the coil. The orot is hand made by the Rungus men as the technique is known only to them". The bobolizan originates with the Tuaran Lotud group of Sabah, but according to Rose Sabala sometimes Rungus wear bobolizan to talk to spirits in the old language. There are also sad'ang, earrings that sometimes have beads attached. Many of the beads used by the Rungus are plastic and glass imitations of older heirloom beads. Materials such as plastic spoons were heated over a flame and the hot plastic are then winded onto a metal rod to make yellow beads. Three Rungus ladies selling home-produced products in Sikuati Town, Sabah, Malaysia. Rungus cuisine is mainly prepared using cooking methods like braising, grilling and baking. Being a community of fishermen and farmers, the staple foods of the Rungus people usually consists of rice and cassava, supplemented with green vegetables and fish. Tinunuvan soguntung is the Rungus term for a preparation of grilled or roasted eggplant. The cooked eggplant is peeled, and served with chillies, lime juice, toasted ikan bilis or salted fish, and sprigs of lompodos (a local variety of basil). The Rungus also prepare simple sweet foods such as flatbread made from sweetened grated cassava (tinopis runti) and bintanok dalai, or mashed corn wrapped and steamed in corn husks. These are to be consumed for breakfast or as snacks. Like the Kadazan-Dusun, Rungus people also celebrate Kaamatan. This festival is usually celebrated on 31 May every year. Even though there are many similarities the way of celebration between this two race but there is also comparison. ^ "Dusun, Rungus, Momogun in Malaysia". Joshua Project. Retrieved 27 August 2015. ^ a b Irene Benggon-Charuruks & Janette Padasian, ed. (1993). Cultures, customs, and traditions of Sabah, Malaysia: an introduction. Sabah Tourism Promotion Corporation. p. 14. ISBN 98-302-0000-0. ^ Rita Lasimbang & Stella Moo-Tan, ed. (1997). "Patricia Regis & Jabatan Muzium dan Arkib Negeri Sabah". An Introduction to the Traditional Costumes of Sabah. Natural History Publications. ISBN 98-381-2013-8. ^ Bucklee Bell. "Beads and Beadwork of the Rungus of Sabah (Part Four: Other Ornaments)". The Bead Site. Retrieved 26 January 2017. ^ "Indentiti Dan Budaya". Lembaga Bandar Kudat. Retrieved 26 January 2017. ^ Herman (2000). "The Rungus: The Art of Blending Traditional Life-Style into the 20th Century". The Flying Dusun Sdn Bhd. Retrieved 26 January 2017. ^ Mohd Yunus Yakkub (2015). "Rungus Kudat kaya budaya". Kosmo!. Retrieved 26 January 2017. ^ Puay Liu Ong (2008). Packaging Myths for Tourism: The Rungus of Kudat. Penerbit Universiti Kebangsaan Malaysia. ISBN 96-794-2826-5. Wikimedia Commons has media related to Rungus.